There's a lot of flavoring on them, and they're very tasty, but the garlic is fairly mild (probably because it's roasted rather than fresh garlic). This could be good for those of you who would avoid something that was too garlicy. There's some cheddar in the flavoring too, but the garlic is far more noticeable. 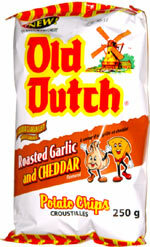 Old Dutch packed a whole lot of chips into this large bag, which is typical for Canadian chip makers. Smell test: Smells like freshly chopped garlic. Very garlicy, nice.